Parisian design studio Jouin Manku has designed the interiors for two public spaces on Celebrity Cruise’s new luxury cruise ship, the Celebrity Edge. Launched as the first in Celebrity Cruise’s new series of ships, Edge-class, Celebrity Edge is a cruise ship that was constructed at the STX shipyard in France. The vessel had her first maiden voyage on the 9th of December 2018, setting sale from Fort Lauderdale, in Florida. Interestingly, Celebrity Edge is the first ship to be designed completely in 3D – and a number of international designers were commissioned to design the ship’s interiors, including Kelly Hoppen and Parisian design studio, Jouin Manku. Led by Patrick Jouin and Sanjit Manku, Jouin Manku is a design studio renowned for its dynamic process that incorporates product design, architecture, interior design, traditional craft and new technology. 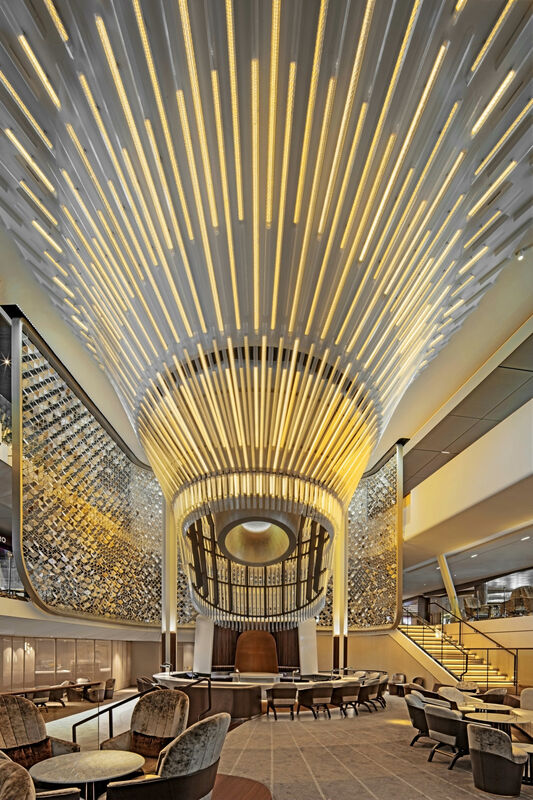 On board the Celebrity Edge – which is the studio’s first luxury cruise ship project – Jouin Manku was responsible for the design of the The Grand Plaza, the Main Dining Atrium, and the connecting circulation spaces between the two public areas. For their designs, Manku and Jouin sought to create a sense of excitement and wonder, after being inspired by their desire to capture the magic of travelling by sea. However, it was also important for the team to use modern techniques and materials. The studio has a specific way of beginning each project, and for Celebrity Edge, the studio first imagined how guests within the space would feel as they moved through it. From this stimulus, the team began to create the space; they designed every aspect of the interiors, from the architecture to the carpets and lighting, in order create a complete guest experience. Part of Jouin Manku’s design plan was also to remind guests on board the Celebrity Edge that they were still on a ship, instead of hiding this fact; they wanted to complement the feeling of a luxury, boutique hotel with the extraordinary experience of travelling by sea. Part of the brief of the Celebrity Edge was to celebrate the craft of the shipbuilders and welders who constructed the vessel; to do this, the design team collaborated with the shipbuilders to find forms that would show off the ship’s internal steel columns. This meant that the interior design could feature the ship’s skeleton – highlighting the construction of the ship – in an aesthetically pleasing way. Manku and Jouin also played with fluidity and avoided rigid surfaces when creating the interiors for both the Grand Plaza and the Main Dining Atrium, after finding inspiration from the way that ships curve, and the way that they often lack sharp angles within their design. The result of this is that in each of the spaces the studio designed, ceilings and walls have been shaped to complement the structure and surrounding curves of the ship. The Grand Plaza was the first of the spaces designed by Jouin Manju; used by guests at all time of day and night, the Grand Plaza connects one end of the Celebrity Edge to the other. The studio decided to turn the Grand Plaza into a piazza of sorts, surrounded by cafes and restaurants; the team’s aim was to create a space that was intimate, warm and comfortable, but that could also be remarkable. Encouraging guests to speak and interact with each other, a circular bar lies at the centre of the Grand Plaza. Above this sits a feature chandelier, created by Kalmar, which changes depending on the time of day. During the day, the chandelier acts as a large sculpture that dominates the space; as the sun sets, it begins to grow orange and illuminate the Plaza. Later in the evening, the chandelier acts as a ‘beating heart’, pulsing and dancing and creating a lively evening atmosphere. Around the chandelier and central bar, the Grand Plaza’s lounge is terraced; this creates a variety of settings to create a sense of intimacy in what is otherwise a large, open space. Another way Jouin and Manku have maintained intrigue in the Grand Plaza is by installing three large screens, which are set in the central lounge areas. 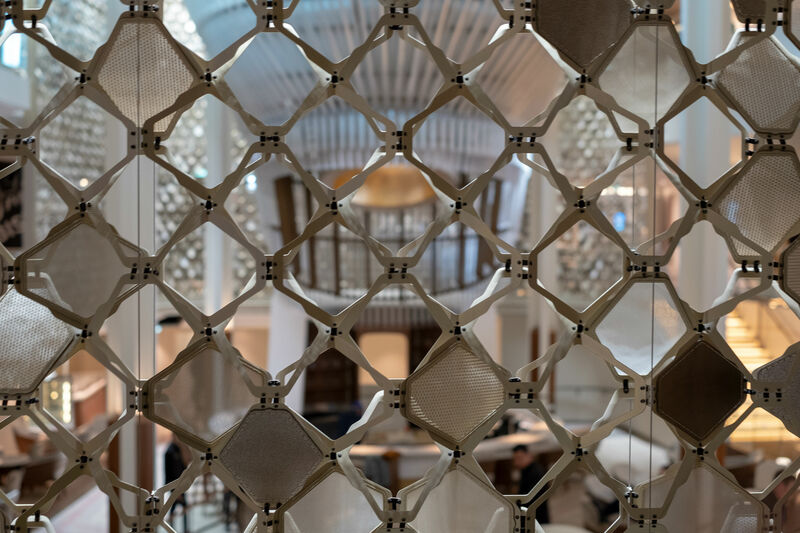 These have been designed in collaboration with Studio MTX, an architectural embroidery specialist; each of the screens repeat a series of segments that have been crafted in leather, metals or fabric. The design studio has also created the interiors for the Main Dining Atrium on Celebrity Edge, as well as an ‘exposed corridor’ – the circulation spaces that lead between the two main public areas, the Plaza and Dining Atrium. As the corridors are set within the very centre of the ship, the studio was inspired to work with the angles the ship provided. The walls of the corridors have been dressed in sound-absorbing fabric panels that reflect the light, or open to reveal more of the ship’s skeleton. 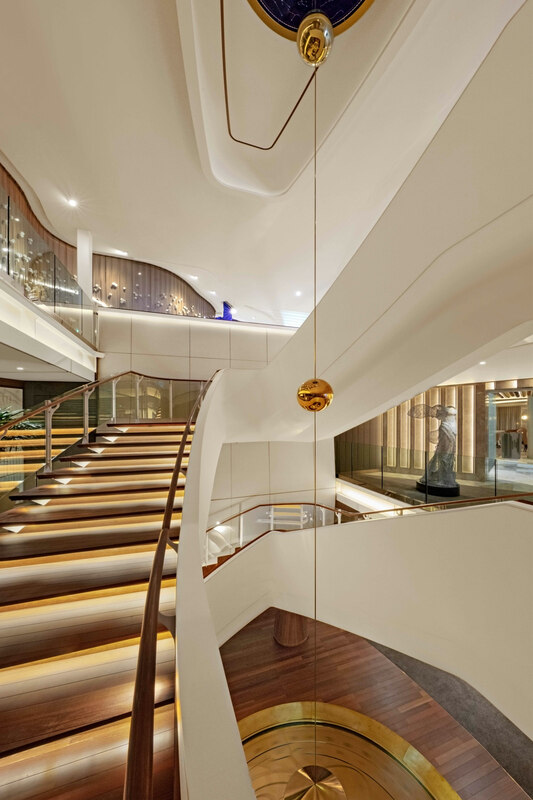 The final space that Jouin Manku has designed, the Main Dining Atrium, is a triple-height space that connects five restaurants across three levels; at its heart lies a curved white staircase that invites guests to explore each of the three levels. 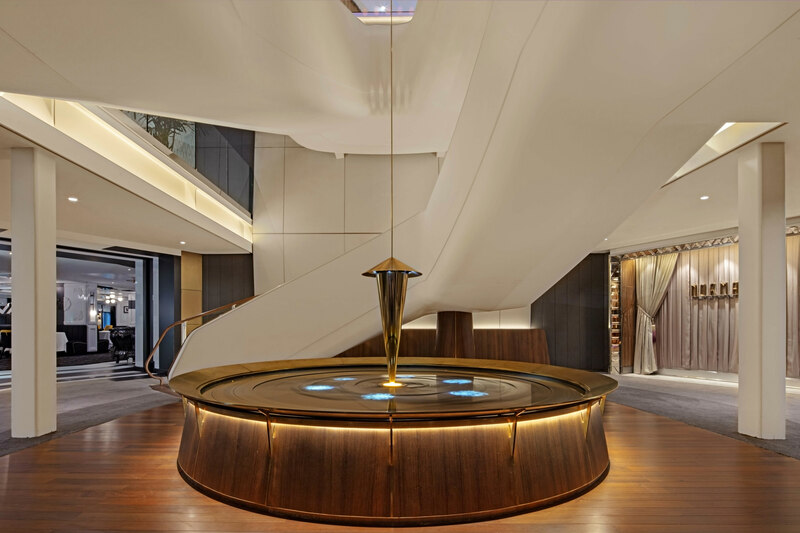 The studio has also designed a focal point for the atrium – a brass pendulum that descends through the centre of the space. Taking inspiration from the ancient navigational tools that seafarers used before satellite navigation, Jouin Manku hope that this installation will remind guests that they are at sea, even if they can’t feel the ship’s movements. Throughout their interiors, Jouin and Manku have used materials including wood, metal, resin and leather, balancing classic style with contemporary finishes. Within the Grand Plaza, everything has been created bespoke for the project, from the installations and furniture. 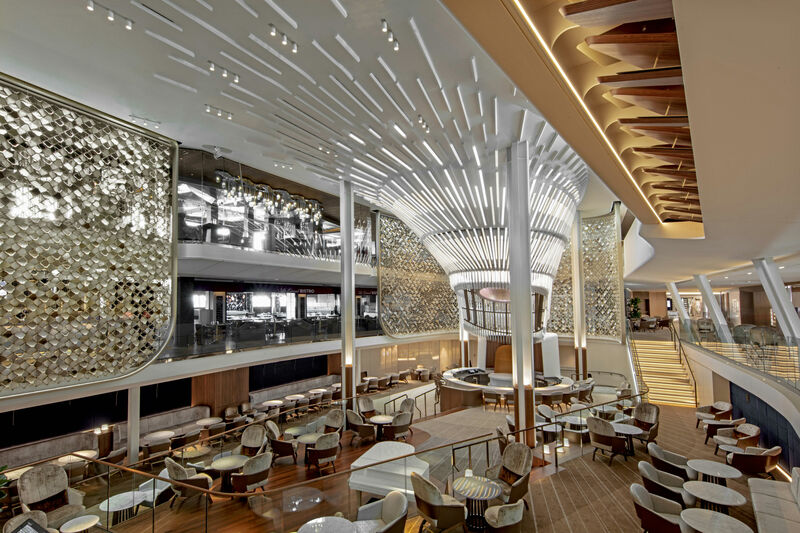 Not a single element in either the Plaza or the Dining Atrium has been designed without thought, proving that Jouin Manku’s unique interiors for the Celebrity Edge will entice guests for many voyages to come.